Risk Amplification: Making Offenders Think Twice, a recent study by Adrian Beck undertaken for the ECR Community Shrinkage and On-shelf Availability Group in Europe, reviewed the available published literature from the past forty years on a wide range of new retail technology interventions intended to control theft in retail stores (for example, EAS, CCTV, signage and stickers, store design and layout, shelf-edge technologies, and the role of store and security staff). It found there were very few reliable studies in the public domain to help loss prevention practitioners draw clear conclusions about what interventions worked and under what circumstances. Most studies were either very dated and/or used methodologies that seriously undermined the efficacy of the findings being presented. The study did recognize, however, that it was only based on what was publicly available, primarily published in academic journals and books, and that numerous unpublished company-specific cases may well exist that contradict the conclusions drawn in the report. The findings of the study do raise key questions about how loss prevention executives should go about selecting new retail technology interventions to be introduced into their businesses. What methodology should be adopted to ensure they are actually addressing the needs of the business and that performance measures have been clearly articulated? 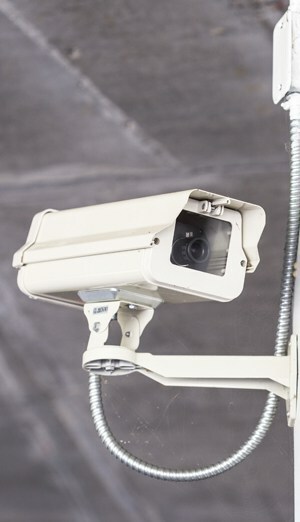 When it comes to significant investments such as a CCTV system, is it always clearly articulated exactly what it is supposed to achieve, how it will deliver its intended purpose, and how its impact will be measured? Too often, the language can be very loose and vague—“CCTV is being introduced to reduce crime and make staff feel safer.” But what sorts of crime will it reduce, and how will it do this? Will the cameras leap from the ceiling and apprehend shoplifters? How will this retail technology make staff feel safer? Will the display monitors intervene when a shopper becomes violent? How will its impact be measured—a reduction in crime? Measured how—through changes in rates of shrinkage or numbers of shoplifters reported to the police? Vague plans and unclear key performance indicators (KPIs) can seriously undermine not only confidence in the technology itself but also the judgement and integrity of those making the case for investment. Developing a clear sense of the purpose of the intervention, the necessary context within which it will operate, the way in which it will work (its mechanisms), and the measurable outcomes that will flow from its use are key questions to consider before deciding on any potential investment. This is particularly the case when it comes to emerging and future technologies where the developers may be both new to the world of loss prevention and still formulating the potential impact their interventions may deliver. For example, there is much current discussion and hype around developments such as drones, robotics, and feature-recognition technologies, and how they may be used within the realm of loss prevention. While a philosophy of “let’s see what happens when we use it” can be appealing in some circumstances, the challenging questions of what they will actually do and how they will make a measurable difference remain key to securing their future use or not in the retail space. 1. Purpose. What is the overall goal of the intervention? What is it supposed to do for the business? 2. Context. What needs to be in place in order for the intervention to deliver its impact mechanisms? 3. Impact Mechanisms. In what ways will the intervention actually work in order to meet its stated purpose? 4. Intervention Outcomes. How will the impact of the intervention be realized? It is perhaps worthwhile considering an example of how this would work for one of the interventions identified by the benchmark research on emerging technologies—smart shelves. In the example table, the purpose of the intervention is to provide greater awareness of when products are removed from a shelf or display. Typically, this type of intervention is used for high-value items or those considered to be at risk of sweep thefts (high-volume stealing). The specific context of the operation of the intervention is potentially threefold. First, sales staff and/or security staff are alerted (via some form of communication device such as a smartphone or pager) when a product is removed or an unusual quantity of products are removed from a shelf or display (indicating a potential sweep theft), offering them the opportunity to approach the customer to offer help with their product selection and payment. For the genuine customer, this can be perceived as attentive service, while for the prospective thief, this level of attention would normally lead to them being deterred from carrying out their intended criminality. Secondly, the smart shelf could trigger video recording of the person(s) removing the items. Thirdly, the smart-shelf activation could send an alert when the last product has been removed from the shelf or display, highlighting an out-of-stock situation. By recording the instance when the products are removed from the shelf, the retailer is increasing the chances of identifying persistent or known thieves and increasing the likelihood of having more evidence to prosecute them in the future. Finally, by alerting staff when the shelf or display is empty, the intervention is increasing the likelihood that out-of-stock situations and the subsequent loss of sales is minimized. The final component of the framework requires that the intervention outcomes are identified. In this example, five have been suggested—four positive and one negative. In terms of positive measures, retail losses (probably measured through SKU-specific shrinkage numbers) should be reduced as more would-be thieves are deterred. They should also be reduced because more thieves are prosecuted and banned from entering the store through the greater availability of CCTV evidence. Lost profits from out of stocks should also be reduced by having greater inventory accuracy because fewer items are leaving the store without being recorded and by ensuring fewer out-of-stock events go unnoticed by store staff. However, there could also be a negative impact of the intervention—would-be thieves could be displaced to other products in the store that are not protected by the intervention. 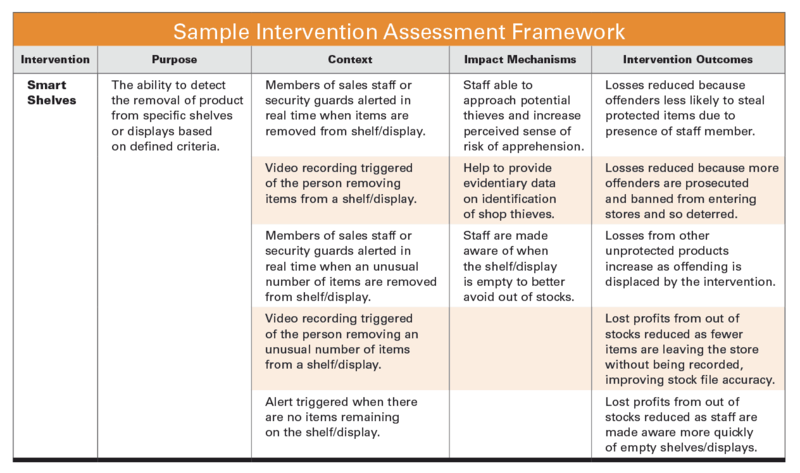 Learn more about additional benefits that may be generated by using this framework to evaluate new retail technology interventions in the full article, “Adopting an Intervention Framework in LP,” which was originally published in 2017. This excerpt was updated February 5, 2018.